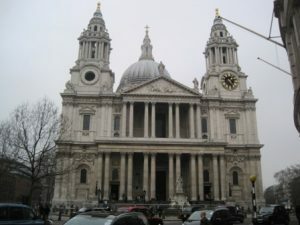 St Paul’s Cathedral is a Renaissance style Church of England cathedral. The cathedral has a rectangular footprint and is orientated east-west. 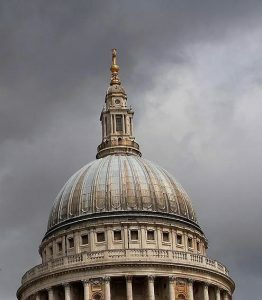 The immense building is dominated by its central dome which has an overall height of 108 metres, this is balanced by two tall bell towers on either side of the massive Great West Door which frame the dome when viewed from the principle approach which is along Fleet Street to the west. The interior of the cathedral is vast. At the eastern end furthest from the Great West Door is the quire and beyond that the high altar. On either side of the quire are ornate carved choir stalls and ornamental wrought iron gates separate the aisles from the altar. The dome was based on St Peter’s Basilica in Rome and is actually 3 domes, one within the other, with the outer dome being supported by the inner. Inside the base of the dome the Whispering Gallery is reached by a flight of steps in the western side of the south transept. The Whispering Gallery has a diameter of 32 metres and is 30 metres above floor level, it is so called because a whisper made against the wall at any point around its circumference is audible to a listener with an ear against the wall anywhere in the gallery. More stairs lead to the Stone Gallery which is an exterior viewing platform and a final flight of stairs leads to the Golden Gallery which provides stunning 360 degree views of London. The crypt in the basement is reached by flights of stairs located on the eastern side of both the north and south transepts. It houses a shop and a restaurant and tombs and memorials to various famous people including the Duke of Wellington and Horatio Nelson. 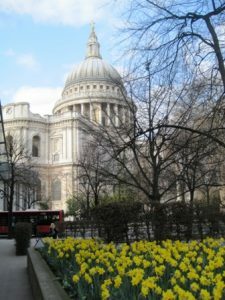 St Paul’s is visible from locations all over London and is one of three strategically important landmarks identified in the Mayor’s London Plan (the others are the Palace of Westminster (Houses of Parliament) and the Tower of London. Two views of St Paul’s Cathedral are designated as protected by the London Plan – the view from Westminster Pier and the view from King Henry VIII’s Mound in Richmond Park. The cathedral is open from Monday to Saturday. There is a fee for entry. The cathedral was re-built in the 17th century under the direction of Sir Christopher Wren on the site of an earlier Norman Gothic style cathedral at the top of Ludgate Hill (which is the highest point in the City of London). This earlier cathedral was destroyed by the Great Fire of London in 1666. It is thought that there has been a place of worship on the site for over 1400 years and a cathedral since 604 AD – this earlier Saxon edifice was destroyed by Viking raiders.